Free tool for configuring Outlook folder permissions for selected users in bulk. 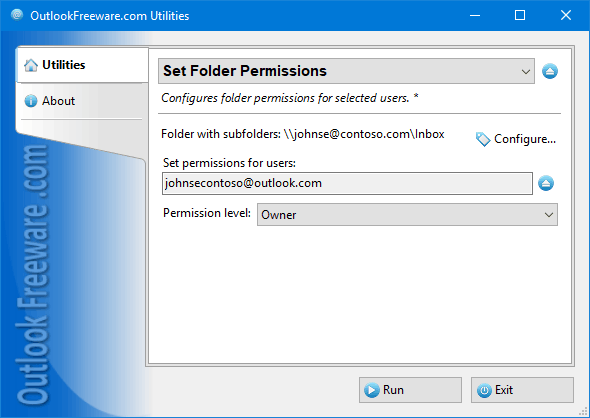 This utility modifies or adds the permissions for the selected Outlook folders in Exchange Server and Office 365 mailboxes, as well as in Public Folders. It allows you to change the permissions for calendar, contact, task, email and other folders. You can set permissions for selected and anonymous users, as well as default permissions. Standard Outlook tools restrict the ability to edit folder access rights. You can configure permissions for one folder at a time only; there is no mass customization for many folders and users. Moreover, there is no way to set permissions using the command line or by schedule. The utility provides the flexibility when solving various tasks related to configuring Outlook, Exchange and Office 365 folder permissions. Simply select the folder, specify users, set permissions, and run the utility. When you configure the permission set, you can select the standard Outlook permission level or specify custom rights to read, edit, delete, create and others. Command line support allows you to use the utility in many scripts and scenarios. For example, as a migrations helper, to run by a schedule, to restore folder permissions backups, and for other tasks when configuring user access rights to Outlook folders. This page was last modified on 11 January 2019, at 07:16.